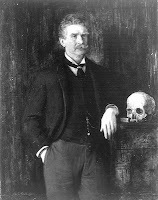 Though The Devil's Dictionary eventually became one of Ambrose Bierce's most well-known works, the book had a difficult beginning. The first "complete" version of the devilishly humorous reference work did not appear until 1911, sandwiched in volume 7 of a collection of the author's writings. The first half of the book, up through the entries for "L," had been published in the mid to late 1880s under the title The Cynic's Dictionary. Bierce did not appreciate the watered-down title. As he wrote in 1906: "They (the publishers) won't have 'The Devil's Dictionary.' Here in the East the Devil is a sacred personage (the Fourth Person of the Trinity, as an Irishman might say) and his name must not be taken in vain." The earliest published appearance of the book, however, came on December 11, 1875, when the San Francisco News Letter published a few "A" definitions under the heading "The Demon's Dictionary." Accoucheur, n. The devil's purveyor. Acquit, v.t. To render judgment in a murder case in San Francisco. Adam's Apple, n. A protuberance on the throat of a man, thoughtfully provided by Nature to keep the rope in place. Apologize, v.i. To lay the foundation for a future offence. One can only imagine how Bierce might define "blog" or "internet" today. For more from The Devil's Dictionary, see this site. *For the dates and details above, I am indebted to Robert F. Gale's An Ambrose Bierce Companion (Greenwood Publishing, 2001).